Political economist and statistician; born in Odessa, Russia, Jan. 9, 1869. After completing his studies at the gymnasium of his native town, he entered the technological institute in Carlsruhe, Baden, and took a diploma as chemist. He next studied political economy at the University of Munich, graduating (Ph. D.) in 1895. He continued his studies in England and France until 1898, when he was appointed privat-docent in political science at the University of Zurich. In 1899 and 1900 he revisited France and England, and went to Russia in the winter of 1901-1902, when he submitted to the Russian minister of commerce, W. Kowalewski, and to the minister of finance, at the request of the former, an expert opinion with reference to the renewal of the commercial treaty between Germany and Russia. 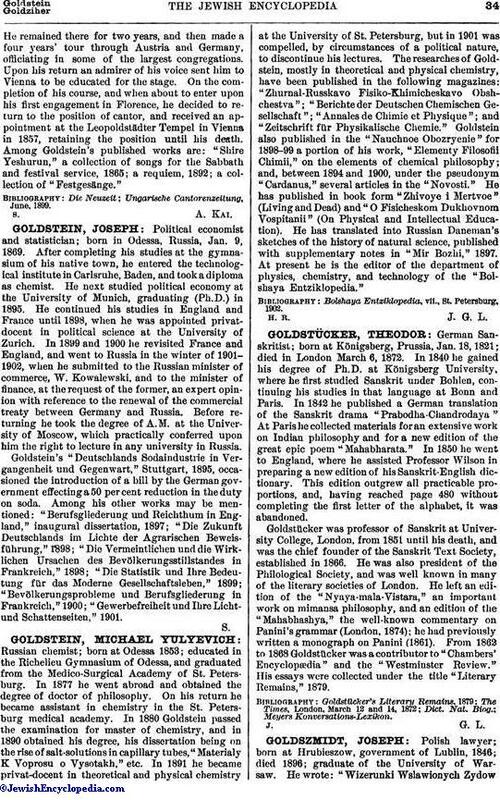 Before returning he took the degree of A. M. at the University of Moscow, which practically conferred upon him the right to lecture in any university in Russia. Goldstein's "Deutschlands Sodaindustric in Vergangenheit und Gegenwart," Stuttgart, 1895, occasioned the introduction of a bill by the German government effecting a 50 per cent reduction in the duty on soda. Among his other works may be mentioned: "Berufsgliederung und Reichthum in England," inaugural dissertation, 1897; "Die Zukunft Deutschlands im Lichte der Agrarischen Beweisführung," 1898; "Die Vermeintlichen und die Wirklichen Ursachen des Bevölkerungsstillstandes in Frankrcich," 1898; "Die Statistik und Ihre Bedeutung für das Moderne Gesellschaftsleben," 1899; "Bevölkerungsprobleme und Berufsgliederung in Frankreich," 1900; "Gewerbefreiheit und Ihre Licht- und Schattenseiten," 1901.